Olfa's Rulers have a frosted acrylic surface with black numbers for clarity on light and dark color fabrics. 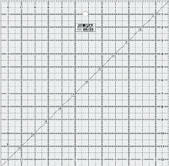 They feature easy to read numbers and grid lines - 1" grid with 1/2", 1/4", and 1/8" increments. They also include markings for both right and left-handed use. This ruler also features a unique angle cutting grid design allowing the user to make perfect 30, 45, 60, and 90-degree angles. For use with Olfa Rotary Cutters.